At first, I had the idea of doing like of a mashup or combining music lyrics and individual pieces of literature. To do that I would need to have the coding for a generator, which I’m not sure if that is possible. The second idea that just came to mind (thank you Dr. Zamora) is the idea of a love story. I’m not one to write about my personal relationships unless it involves my family, but I’m thinking about creating the story of my boyfriend and me. From how we met to where we are now. Since we are currently involved in a long distance relationship, I’m thinking about having the multimedia include worldwide images, songs, video clips, photography, and voice. The first page is going to be the cover page with a description of the two characters who are in the long-distance relationship. Also, on the cover page, I would like to tell their love story before they enter the interactive piece. The female character will be in America, and the male character will be in China. With the two globes connecting along with the flags and planes, I want it to look bubbly and inviting. Once someone hits enter on their mobile devices or computer, they will see a double screen page of the two characters’ rooms. HER ROOM and HIS ROOM. Underneath those titles, I want a small description of the room or maybe about the character. I could set a time and place as well that way the reader can have a better sense and more concrete concept of what is going on. Beginning with HER ROOM, it is set in the daytime. There will be three icons that the reader will be able to click on. The first one will be a photo/video album. Once they click the album, they will be able to view key moments that the couple has had before being in their long-distance relationship. Each picture and video will have a description as to why these moments are so important. Between five and ten photographs and videos should be enough, depending on how difficult it will be to make it. The next one will be the poetry book. Here, the reader will be able to read different poems and quotes written by me. This gives me the opportunity to show that this is, in fact, a piece of literature and not just a game. The last one, the reader will be able to look at the female character’s diary. Another part of the literature aspect of the piece. The reader will be able to see the dark and hard times that happens in a long distance relationship along with the good times. On the other side of the screen, the reader can take a look at HIS ROOM, which is set at night. Just like HER ROOM, this room will have three icons. The first one is a speaker icon where the reader can hear the two characters’ voices. They will hear voice messages left by one another for each other. Sometimes you will hear happiness, sadness, crying, one of them being upset, and frustration. I’m not sure if my boyfriend and I will use our own voices or I might have other people instead. The next icon is music notes. This is one of my favorite parts because the reader will be able to see the characters’ playlist that they made together. I want the link to be able to open up to Spotify or Apple Music where they can hear the songs and listen to the playlist. I am still working on this part and how I can make it more exciting. The last part is called “365”. 365 will open up to a separate page where the reader can see a box. When they click on the box, they will be able to see 365 notes that the female character gave to the male character. One note a day since her boyfriend will be gone for one year. (Which is something I actually created). There are a lot of kinks that still need to be smoothed out, but I am hoping I receive feedback on how to make this better. I also want to have a more structured story, especially since my story has not ended yet with this. If anyone has any ideas, feel free to comment! Thank you to Emily for choosing to explore the beautiful hypertext poem entitled High Muck a Muck, – such a stunning collaborative work! High Muck-a-Muck: Playing Chinese is an interactive poem, consisting of a website and eight videos which explore the narratives and tensions of historical and contemporary Chinese immigration to Canada. High Muck a Muck is most intriguing especially because it was formed through an interdisciplinary collaboration of nine Canadian artists and programmers including Fred Wah, poet, Jin Zhang, composer; Nicola Harwood, project director and designer; Thomas Loh and Bessie Wapp, video artists and performers:, Hiromoto Ida, dancer; Patrice Leung, filmmaker; Tomoyo Ihaya, visual artist and Phillip Djwa, creative technologist. The convergence of so many gifted practitioners has produced an exceptionally rich and complex piece, which definitely pushes beyond the traditional confines of “text”. The addition of an installation version of this piece lends further complexity by offering the work up as an event. Emily walked us through many of the most significant images/tropes of the piece while sharing her sense of the diverse options for navigation. The piece explores the multi-lenses of diaspora and globalism while provoking us to think further about the impact of dreams steeped in the challenges of exile or migration. We could see the way in which embodiment (the body) is wrapped up in conflicted pasts and presents, and how the myths of immigration are often a gamble with many different resulting outcomes. The final tone of the work is ambiguous and dispersed, with a haunting lack of resolve. There is loss despite gains in this journey to a new world. Thank you Rene for choosing this special piece of #elit. 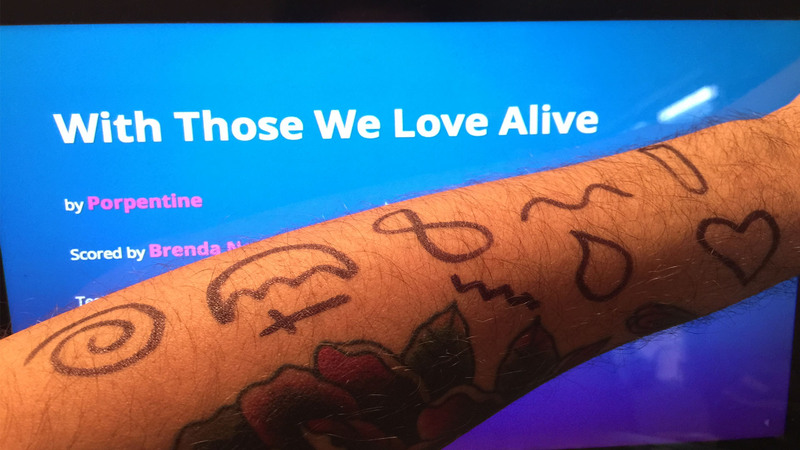 Porpentine’s With Those We Love Alive is a Twine game that invites the reader to become physically involved through marking up their own body with symbols throughout “game play”. Traditional interactive fiction, With Those We Love Alive makes use of text and audio and simple backgrounds of shifting colors to draw the player into a disturbing science fiction landscape. Rene’s thoughts on this piece were smart and truly insightful. If this is an interactive fiction about trauma and survival, it is also a looping experience of false starts and roads that keep leading us to dead-end traps. To read the story is to experience the thematics which mirror the “relationship with the chasm”. For the next couple of weeks, we have before us a stretch of some “asynchronous” work. We will keep our conversation going with both your blog reflections and the continuing backchannel #elitclass exchange on Twitter. In other words, don’t drop your #elit work!! Next week we will conduct our learning in an asynchronous fashion (no in-person meeting on Oct 30). 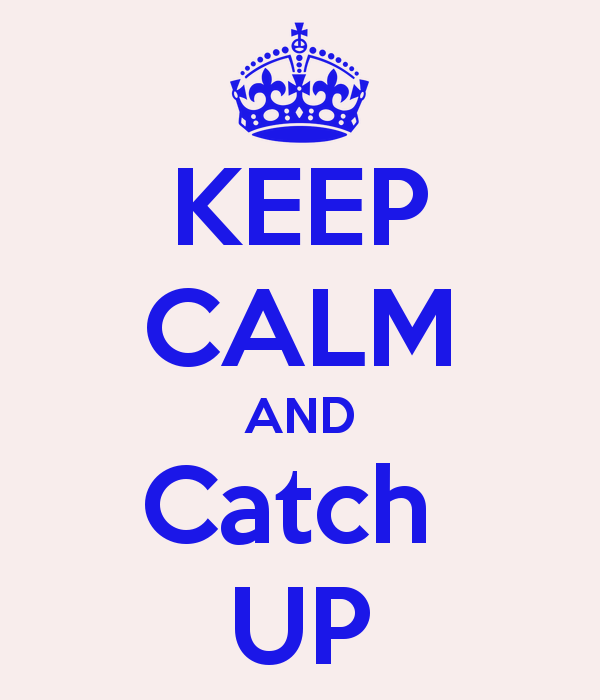 Instead, we will designate the week a “Catch up on Blogging Week”. What does that mean? It means that if you are a bit behind in your blogging, you can take the time to post a “catch up” blog by Tuesday, October 30th that will be counted as a “make-up” for a post that you might have missed. You are welcome to write about any of the #elit pieces we have discussed thus far if you have not yet covered that choice in a blog reflection. The week after is Election Day so we do not have class, BUT you do have a blog post due Tuesday, Nov.6th. Please write your seventh #elitclass blog post. This blog post should include your #elit storyboard along with a reflection on your own #elit storyboard concept and process. By now, you should have generated some ideas for your own electronic literature creation. If you need to refer to the “storyboard concept” please click here for some guidance and a reference point. Remember, you can sketch, doodle, map out ideas in whatever creative process works for you. If you choose to work in this way, please take pictures of that work and include that material in your 7th blog post. 1. Please read Icarus Needs. Serken will do our walkthrough and present and lead our discussion on this play on comics and classic video games. 2. Please read Lexia to Perplexia. Malcolm will present a walkthrough of this fascinating “delivery machine”. 3. Please write your eighth #elitclass blog post: you can write on one of the above two selections or both texts. I still encourage you all to tweet your blog post using the #elitclass hashtag. Check out your classmate’s blogs as well since there is a wealth of insight generated there. Remember to backchannel conversation on our #elitclass hashtag for the next several weeks! I will be looking there (as well as on our course site) for your blogs and reflections. 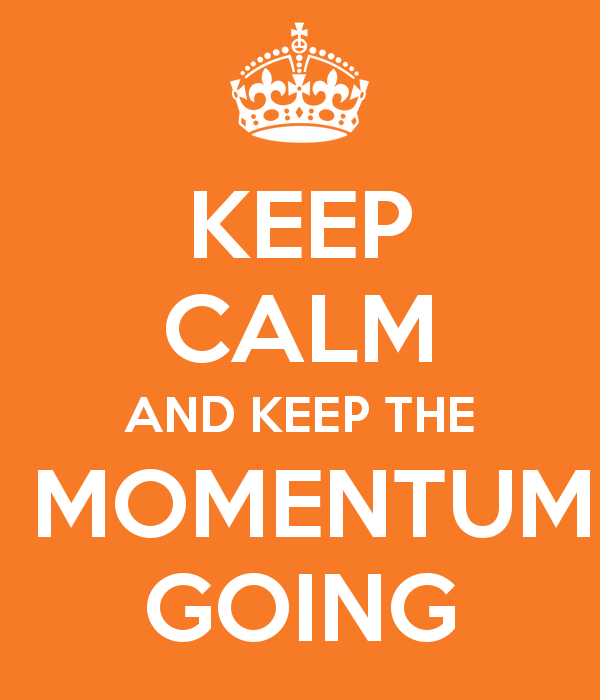 Keep up the momentum #elitclass!! In the narrative High Muck A Muck a group of authors Fred Wah, Nicola Hardwood, Jin Zhang, Bessie Wapp, Thomas Loa, Tomoyo Ihaya, Hiromoto Ida, Phillip Djwa, and Patrice Leung, present a three-year project representing the history and culture of Chinese immigrants in an interactive way. The story begins at the body, that is the home of the story. The body parts represent seven cities each having their own meaning of Chinese history. Canada represents the arm of the body. In the arm, there are red veins that connect each point together making the connection of Chinese immigration to Canada. Victoria: Has several gates, each representing different locations of a Chinese story. These include restaurants, a cemetery, a park, a door of no escape. Nelson: Likewise, this section of the body represents different locations such as a restaurant that serves rice (a traditional food of China), laundry place ( typical Chinese business) and some other significant places. Vancouver: In this part of the body the reader follows the life of an individual named Charley. He is an immigrant who moved to Canada from China we hear his voice as he tells the story of his experience as a Chinese in China tows. The other individuals in this image are standing on what seems to be a train track or outline of a city street. When I clicked on each person, they provided words of wisdom and appreciation for their new life. Pacific Rim: I’m not sure which part of the body this section represents, even so, in this section there are three ships in the middle of the Pacific ocean. Each ship tells a short poem about the Chinese-Canadian voyage experience on the ocean. Everywhere and Nowhere is simply a reflective video that zooms into the eyes of an older male person which then zooms out of the eyes of a newborn baby. These two people make the connection between the old and new life is both everywhere and nowhere particularly. I absolutely loved this elite piece. The background music sounded beautiful and made a connection within each body part. The sounds of people talking, children playing, items making nouse all flowing simultaneously did not create a havoc noise but it was important to make a connection. I felt that the images were also well put together and the poems were significant in meaning. The videos on the cultural and historical background of China was enlighting and authentic. I appreciated the contribution and different styles of each author because it created a unique piece of literature. My first feeling when I played with it is ” It is so smart!” and “Maybe I can make one”. It is a twine game that readers are able to be physically involed in the plot, and whatever they choose, it will change the plot. A reader is also a writer. Basiclly, I can read a fundanmental framwork set by the author. Whatever I chose, I would have same hyperlinks to go. “Balcony”,”Your chambers”, “Garden”, “Workshop” and “City” are a basic trial. What I found interetsting is there are more possibilities we can create. We are able to connect or embed ourselves in the plot by mixing our personalities into it. When I went to some hyperlinks, I found they are optional when I clicked them, I could choose the month of my birth, my elements, my eye color, the equipment and materials I had. It’s very intriguous because it comes different consequencies based on different choices. Compared with former pieces, “With those we love alive” is not surprising. It has basic features of an elite and the interactions are not advanced. It is not bothered by techniques, and is pure and reable literature. But it is meaningful in the time when we are beginning our first elit. WHY COULD NOT I MAKE A PIECE LIKE THAT? Even though I am a not skillful programmer and I don’t know how to visualize my elit, I can still make an excellent piece! The piece inspires me a lot and I am happy to see more possibilities. “Hi Muck A Muck: Play Chinese an Interative Poem”- I am pride to see my language shown in elite. It is so culture-related. The first page and navigation are touching. It is a man who is reading his language, missing his home. His tears as well as his emotion is an direction for us to read the piece. When I heared the audio, they talk about China Town and Chinese women are not allowed. I was so upset and I can understand how difficult Chinese immigrantes are in foreign countries. The background music is from a restaurant nosie to a flute, which illustrates the life of a China Town and people’s strong emotion – nostalgia. The page touches me – my land is my body. 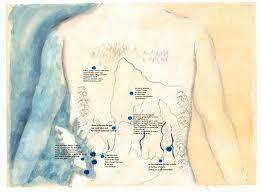 You may see rivers, moutains, and poetry on an human body. They represent “my” homeland and “my” culture. “My blood is China, which makes me who I am”. Especially when Chinese are away from thier land, we carry with our indentities everywhere. China is our nature. It is an emtional piece. I am deeply touched by every pages. It not only shows “a deep engagement with issues of racism, intercultural exchange, imitation, history, economics, and Chinese immigration to Canada”, but also it tells a story, a life story, about every Chinese away from our country and every Chinese who are missing thier country. I can find myself in it. One of my favorite stand-up comedians of all time happens to be Mitch Hedberg. He was known for his surreal and unconventional humor that most people failed to understand. He was considered an oddity by some. For others, like me, he was a genius and ahead of his time. Announcers on stage would often introduce him as the man who sees the world through rose-colored glasses. He used to wear a pair of colorful shades on stage but that was not the reason that he was given that label. He saw and interpret the world in a new light. This particular literary work, With Those We Love Alive, is a perfect medium to experience that alternative interpretation of reality. The feelings that people sense, and sometimes endure, are often difficult to place in words. Sometimes, it is much easier to convey those feeling through metaphorical means, such as abstract artwork or poetry. With Those We Love Alive, is an electronic literature that examines the feelings that come along with life experience, and presents them to the reader through rose-colored glasses. Heightened colors of the background, ambiance music, and figurative form of writing create an aura of frustration and despair. There is an overall theme of decay in the story; physically and mentally. The main purpose of With Those We Love Alive could be considered a self-reflection. It is an examination of sorts. The reader (or the player) is able to make choices that affect the story at times, but also able to make choices without a specific consequence just to reflect on them. A great example would be crafting a gift for the character, the Empress, only to have it simply placed over her throne for you to look at it as you continue to read (or play) the story. The type of gifts that you craft varies depending on whom it is for. The gifts for the Empress are either brandish or glamorous whereas the gifts that you craft for yourself are more personal. The telescope that you can craft and place on the your quarters’ balcony is a great example as it represents the wonder of what is beyond the known reality and seeking another life. This one represents the position that you may find yourself in society. The player is given the choice to join or reject a mob violence. You can either choose to be part of the group and do the things that they do despite how repulsive they may be, or you can choose to be alone and isolated to avoid actions expected of you. This particular part, in my opinion, examines what it means to feel free as opposed to being oppressed, and what sort consequence it may have over someone’s mind, such as ever-lasting loneliness. This one represents the lack of courage that people experience at certain points of life. One could draw a parallel with public speaking; the greatest fear.The reader experiences a failure due to lack of courage among other people and asked to consider the aftermath. In order to achieve success, one must discover the strength to leap forward. This one represents the hidden identity of a person and bottled up emotions that consume the mind. In other words, being a damaged person. The reader explores the mysterious past of another character whom he or she is in relationship with. The given task is to convince that character to let go of that past and find a new purpose in a new life. It is always important to remind ourselves that the future holds more opportunities when we are free of our burdens from the past. This one, specifically, represents seeing the world in a different way. The reader experiences what it is like when someone attempts to use drugs to overcome emotional pain. It is an easy method of escape that people turn to whenever their lives make them feel trapped. The creator of the story manages to convey that feeling by keeping the reader inside a limited space with a very limited amount of activities to perform until a major even occurs. The way the descriptions of things which you examine is written reflects the emotion of suffocation that one may endure. So, the characters use drugs to escape that pressure. They believe the effects they experience allow them to express their thoughts and bring out their bottled up feelings to the surface more freely. The sigil is also ironically named ‘insight’ to ponder upon. Each sigil represents a mark left over someone’s body or soul after a tangible experience. It is also an analogy of making a cut on the arm. Some people tend to exercise self-harming in order to feel alive, feel relief from bad feelings, or express strong feelings of desperation, longing, and emptiness. They feel overwhelmed by their lives and do not know alternative ways to get relief from emotional pain or social pressure. The important point that With Those We Love Alive reminds us that this is self-inflicted, and it could be overcome no matter how difficult it is. Despite the decay that people may experience in life, there are things that can still offer them hope: the good people around them, who are still alive to reach out and ask for emotional support and a guiding hand. They are worth cherishing. It is also very important to remember that nobody is truly alone. As long as you have the will to discover the strength within you that already exists, you can find love and respect that will diminish the yearning for death permanently. People fail to realize the importance of those around them, or appreciate the possibility that they also mean a lot to them, until they are gone. Mitch Hedberd died of a cocaine and heroin drug overdose in 2005.